Apply by April 1 to Write for the ICNC Monograph Series Published & Forthcoming Monographs: Topics & Authors Eligibility and Requirements Publication Format Stages of Monograph Writing and Review Monograph Publication and Dissemination ICNC Priority Research Topics in Civil Resistance Apply NOW! produces relevant findings for our target readership: academics, activists and organizers, civil society professionals, the policy and developmental communities, and journalists. The deadline for submitting proposals is April 1, 2018. In 2018, up to four awards, each worth $5,000, will be offered to a prospective author, or shared by co-authors, who have background in the study and/or practice of civil resistance and excel in writing accessibly (for general and academic audiences). We encourage applications that focus on under-researched or under-published topics in the field of civil resistance. Specifically, ICNC is interested in receiving monograph proposals that pertain to our priority research topics and other themes, of particular interest to our diverse target readership. In addition to presenting ground-breaking analyses or findings, monographs are also expected to present general and specific recommendations relevant for our target readership. ICNC Monograph drafts go through an external review process before they are accepted for publication. The reviews are conducted by experts in the field, including though not limited to the ICNC academic advisors. multi-year experience as an activist and organizer of nonviolent campaigns. We particularly welcome applications from promising young researchers, scholar-practitioners, and educators who view the opportunity to write a monograph as an important part of their in-depth reflection on civil resistance practice or scholarship. 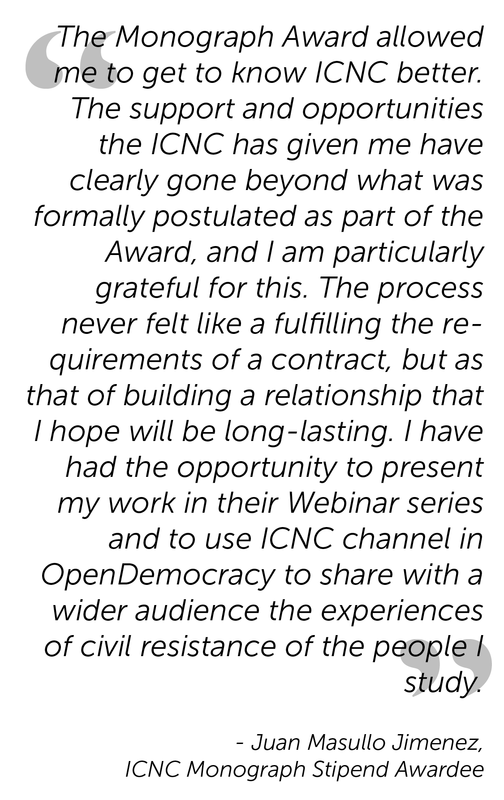 In addition to furthering research, study and resources in the field of civil resistance, these awards have been developed to expand the ICNC network of collaboration. Therefore, preference is given to proposals from people whose research or writing ICNC has not supported in the past. The length of the monograph should be between 15,000 and 17,000 words, or around 60-70 pages (double space, 12 pt. font size, Times New Roman). The author must use Chicago-Turabian style and in-text citations. We highly encourage authors to provide their own images (with permission), such as fieldwork photos, for inclusion in the monograph. Authors may want to review published ICNC monographs to familiarize with themselves with publication format. The introduction should specify the central issue or thesis to be addressed and state clearly the main questions to be answered. It should also explain the added-value of the study to existing literature. Analytical frames and concepts will ideally be supported by empirical examples, observations, narratives, historical or contemporary accounts provided by dissidents, organizers and activists, and cases of civil resistance. Authors should use qualitative or quantitative methodologies, or both, supported by practical examples of nonviolent resistance. Based on the analysis presented, the monograph must provide an explanation of how its findings and analysis are relevant for general and specific readerships, and for movement practice in the field — for example, in the conclusion. Authors are also encouraged to include policy recommendations and key takeaways for different constituents (activists and organizers; international practitioners; policy makers; scholars) informed by the findings of their monographs. Authors are expected to deliver their draft monographs within 6 to 9 months of receiving their award (once appropriate documents are signed by all parties). Authors should expect to collaborate regularly and closely with the ICNC Series Editor and an in-house developmental and copy editor to ensure the quality of the final publication. Responsiveness to the editors and their requests is crucial to ensure smooth writing progression. Reminder: ICNC Monographs are written with the non-specialist reader in mind. The quality of analytical and empirical analyses equal that of a serious academic publication, but the language and terminology used are not overly academic and are accessible to a broad-reaching general readership. Applicants must therefore avoid unnecessarily complex or overly scholarly jargon and demonstrate the ability to write clear, accessible, and vivid prose. Once the revised monograph draft is submitted to ICNC we initiate copyediting and layout/graphic design, and continue working closely with the author during this process. After the completion of the final draft and graphic design, ICNC makes the monograph available on-demand via Amazon, where the readers can order a hard copy or/and e-book for a small fee that covers printing costs. The monograph PDF is also made available free of charge on the ICNC website. ICNC and the author will collaborate to strategically disseminate and promote the monograph. As stipulated in the contract, the authors might be expected to present their monographs during a webinar and/or at an ICNC public event in the United States or in another country where appropriate. Strategies for civil resistance campaigns against abusive or unaccountable practices involving multinational corporations—where and how do movements and their allies target or pressure; what strategies, tactics, and framing are most effective; etc. at least one writing sample, preferably on some aspect of nonviolent civil resistance or social movements in general. NOTE: In general, a monograph proposal should address at least one of the identified priority research topics or other themes in civil resistance that an author would be able to justify as warranting our interest. Specifically, in your proposal identify the main research questions, possible answers (hypotheses), arguments and expected findings as well as explain the added value of your study to the scholarship and practice of civil resistance and/or its relevance for the outside actors whose work might benefit from an informed perspective on nonviolent movements and civil resistance. You can also add a tentative table of contents to your proposal. The deadline for proposal submissions is April 1, 2018. Depending on the number of proposals received, it may take up to six weeks to review proposals and contact selected applicants.